After the news that Guerrilla Game's Horizon: Zero Dawn was delayed until 2017, another PlayStation game seems to have been delayed: Persona 5. The updated release date is showing February 14, 2017. 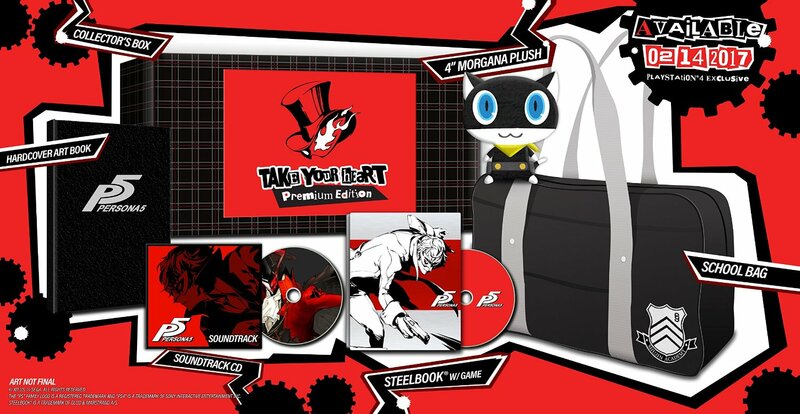 With the news of the delay comes the previously unknown contents and pre-order for the collector's edition labeled the "Take Your Heart" premium edition. It was available on Amazon for about 30-minutes this morning before selling out (unless Amazon has some hidden stock like they sometimes do). However, they still have steelbook cases available for who knows how long. Persona 5's collector's edition includes a steelbook, a school bag, the more-than-likely sweet jazzy soundtrack, 4" Morgana plush doll, 64-page art book, and a collectible box that everything comes in.